Just in time for the new year! Cooler Master has sent us their latest mechanical keyboard, the QuickFire TK. 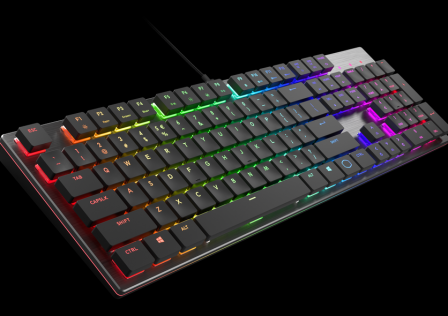 It is a compact, backlit mechanical keyboard. It’s about time these things are seeing the light of day… for the longest time, those of us who wanted backlighting + compact were stuck with either the insanely expensive, odd-layout Deck 82 key, or the not-so-favorable KBT boards. 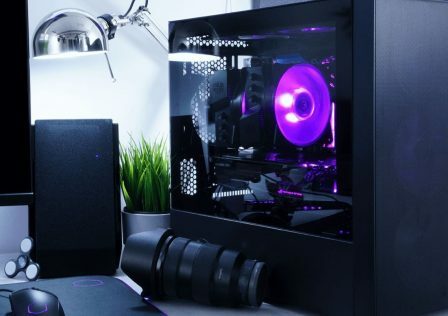 Cooler Master has answered our call with this new QuickFire TK. For more information on mechanical keyboards, please see this guide. It’s actually hard and probably incorrect to call the QuickFire TK “tenkeyless” since it does in fact have a numberpad. But it’s more or less the same size as a tenkeyless board. I suppose “compact” is a better term. It is a 92-key board, using a rare layout. Instead of having a seprate numberpad and separate arrow keys like normal keyboards, the QuickFire TK merges the numberpad with the arrow keys and others, namely Insert, Home, Page scrolling, Delete, and all of those keys located in that area. The result is a compact board without the reduced functionality of a tenkeyless board. There are three versions of the QuickFire TK: a Cherry MX Brown switch model, with a brown colored steel plate and white LED backlighting. Then there’s the Cherry MX Blue model, which has a blue colored steel plate and blue LED backlight. Finally, there’s the Cherry MX Red model which uses red LED backlighting and red steel plate. We’re using the Cherry MX Red version, which is the most recommended switch type (along with Blacks) for gamers, since gamers don’t need and often don’t want a tactile feel. But really, the choice is yours. Without further ado, let’s get on to the review. The QuickFire TK comes in a box that’s very similar to their other keyboards. It’s stylish and descriptive. You’ll find photos and specifications all around the box. The packaging is identical to the other QuickFire boards, having the keyboard covered in a foam bag, and the accessories under cardboard. It gets the job done. Inside the box you’ll find a product guide (not a manual), which showcases other CM Storm products. There’s also a keycap puller which I love to see, and of course, the keyboard itself. The cable is attached by default. Here’s a closeup of the keycap puller. Its purpose is to… what else? Remove the keycaps. To use it, simply align it to a keycap like so. Don’t push it down too deep, otherwise you might damage the switch underneath. Once you have it aligned like this, just hold down the keyboard and give it a decent pull, not too hard. Not much else to say on this page, is there? The keyboard is protected well enough and the packaging is good. There’s no manual, so you’ll have to use the one on their website. Here is the link. Now we’ll take a closer look at the QuickFire TK’s appearance, build quality, and functionality. The first thing that strikes my mind is… this looks just like a smaller QuickFire Pro. How so? The board design and non-standard modifier keys are the same. But it’s a different OEM; the QuickFire Pro is made by iOne, while I don’t know who the OEM is for this one. It’s a Chinese OEM for sure. You know what else suggests that this is a cheaper Chinese OEM? The build quality. Now it’s not bad by any means, and still leagues above any “gaming” rubber dome keyboard (and any rubber dome keyboard I’ve ever used). But it’s obvious that the quality isn’t quite as good as the Costar-made QuickFire Rapid, or even the QuickFire Pro. The QuickFire TK has some heft to it, but if I press down on the upper right side of the keyboard, there’s a little bit of flex (as in the outer shell moving down where I press it, hitting the body underneath). It’s nothing bad or serious, just a nitpick. Though hard to see in any picture, the left bracket key on this keyboard is slanted and a bit out of position. The keycap is on properly, the switch just isn’t aligned properly. Again this is a nitpick, but it’s not the highest quality keyboard. To this. I’m referring to the gunk buildup, not the dust. What is that gunk, you ask? It’s the result of skin oil accumulating on the keycaps. Untextured keys like this just get smudged easier, and this shows up more easily and alters the feel of the keycap more than on a textured keycap. But this is easy to clean of course. Underneath those keycaps are Cherry MX Red switches and a red LED. Red switches are linear, and have a lightweight 45g activation force. This is my preferred gaming switch, but for typing I prefer Blues. 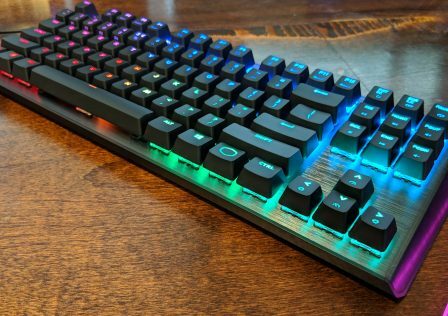 Every key has an LED underneath, like every backlit mechanical keyboard I know of, but unlike every backlit rubber dome keyboard I know of. Because this is a backlit keyboard, that means the big keys such as backspace, shift, enter, and spacebar, use Cherry stabilizers opposed to Costar. My only other Cherry MX Red keyboard, the QuickFire Rapid, had Costar stabilizers (aka wire stabilizers) so now I can make a direct comparison. Closer look at a keycap. Here are Costar stabilizers, courtesy of google images and keyboardlover. You can see that they use a metal bar to stabilize and secure the keycap. And here are the Cherry stabilizers on the QuickFire TK (I removed the Enter key for this picture). Rather than using a metal bar, there’s two stabilizers on each side that look like mechanical switches. The keycap has indents for the mechanical switches and the two stabilizers, so it is secured to all three. Quite straightforward. So essentially, what I’ve discovered is that most of what I read on the two stabilizers is true. Cherry stabilizers definitely do alter the feel of the switch; they feel more mushy, soft, or dampened compared to the keycaps without stabilizers (which includes almost all keys, capslock and smaller). Costar stabilizers do not alter the feel; pressing those big keys feels the same as pressing the keys without stabilizers. On the one hand, Cherry stabilizers seem to be a tiny bit more quiet, but I prefer the feel of Costar stabilizers. On the flip side of the coin, Costar stabilizers make it a pain to remove the keycap for inexperienced people. There’s a technique to removing and installing keycaps, while with Cherry stabilizers, it’s essentially the same as removing any keycap. For this reason alone I prefer Cherry stabilizers. It seems to me that Costar stabilizers might have to be lubricated more often too, but don’t quote me on that. Regardless, Cherry stabilizers are the only ones that work with a backlit keyboard, though I heard that Costar was working on making new stabilizers that work with backlit keyboards. Whichever stabilizer is used won’t affect my score. Anyway, time to move on. The font on this keyboard is like the other CM Storm keyboards. Some like it, some hate it. I personally like it. There’s very little branding, which is a result from user feedback on the QuickFire Rapid. Here’s the back of the keyboard. Interestingly enough, every iteration of the QuickFire keyboard lineup has less rubber coating. The QuickFire Rapid body was completely rubber coated. On the QuickFire Pro, only the back and the sides were rubber coated. On the QuickFire TK, there’s no rubber coating. It doesn’t really make a difference. The TK doesn’t get smudged or scratched easily at all. On the back you’ll find four rubber feet, two foldable feet which feel quite cheap, and cable routing. 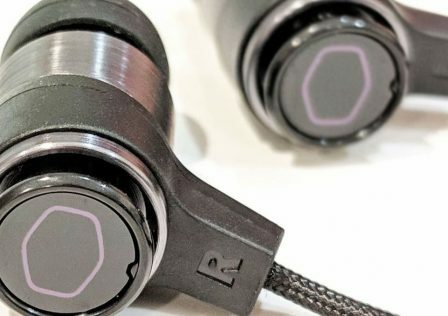 The cable is detachable once again. Excellent feature. The cable is fully sleeved which is nice to see. It has a mini USB connector on one side (the side that plugs into the keyboard), and a gold plated USB connector on the other side. Now we’ll observe the functionality of the keyboard. It’s a plug-and-play keyboard with no software or anything, but it has its own drivers that automatically install when plugging it in, and when switching key-rollover modes. More on this later, but first we’ll look at the numberpad area. It looks like a typical numberpad, but most keys have a secondary function. The 2, 0, period, and double zero keys function as arrow keys. To use the secondary functions, toggle number lock. There’s a visual indicator related to number lock, and the function of these keys. Pressing number lock enables or disables the backlight on the arrow keys. If the light is off, like in this picture, then number lock is disabled and the numbers will be registered. If the backlight is enabled on those four keys, then number lock is enabled and only the secondary functions will be used. This brings us to the backlight modes. Backlighting is controlled as the secondary function for F1 to F4 keys. To use the secondary function on any key aside from the numberpad, hold the FN key and then press it. There are four backlight modes, but on all modes you can still enable or disable numlock to toggle the LED on the arrow keys, and you can also toggle the LED on FN and F12 key. The first mode is Off (no light at all), partial (only WASD is enabled), breathing (all keys pulsate between lowest brightness and brightest), and full backlight, in which all keys are backlit and stay on one brightness setting. Use FN + F4 to toggle between partial, breathing, and full, while FN + F1 enables or disables the backlight. The secondary function of F2 and F3 browse through the five brightness settinigs. Note the secondary function on the Escape key. This allows you to toggle 6KRO or NKRO. KRO stands for Key Rollover which I briefly mentioned earlier. 6KRO means only 6 keys can be registered at once, while NKRO means an unlimited amount of keys can be registered at once. NKRO was originally limited to PS/2, but Cooler Master’s QuickFire Pro, which was USB only, proved capable of NKRO via USB. This keyboard claims to be able to do the same. 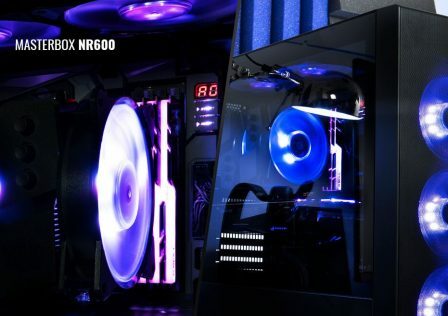 To switch between 6KRO and NKRO, you must hold 6 + Esc for 6KRO, or N + Esc for NKRO. The FN key + Esc does nothing. The secondary function of F5 to F11 are standard multimedia functions, while F12 enables or disables the Windows key. This is a lovely feature, since accidentally pressing the Windows key during a fullscreen program would cause it to minimize. Also note that holding the FN key for three seconds enables or disables it, and you can determine this by whether or not the backlight for the FN key is on or off. If the backlight is off, then the F1 to F12 keys use their primary function only. If the backlight is on, then the F1 to F12 keys use only their secondary function. Here’s the partial backlight mode. And now full backlighting. My photos don’t do it justice, like most backlit mechanical keybards, this one is extremely bright on the brightest setting. This is something cheap rubber dome keyboards don’t have, since they usually don’t have an LED under every single keycap. To summarize this long section, I’m pleased but not impressed by the QuickFire TK. The build quality is worse than the QuickFire Rapid and a tiny bit worse than the QuickFire Pro. There’s a tiny bit of flex on the upper right side of the keyboard, the foldable feet feel cheap, and one of my switches is slightly misaligned. On the other hand I love the backlighting and layout. I like this layout more than a tenkeyless board, since it is nearly as small but retains full functionality. Let’s move onto performance. I’ll do various different tests in this section, including typing speed (words per minute), testing the key rollover, comments on the feel during gaming sessions, PS/2 compatibility, etc. First and foremost is PS/2 compatibility. As I expected, the QuickFire TK does not support PS/2. This isn’t a big deal since it does NKRO over USB, or damn close to it. So that brings us to our next tests: key rollover. I used this website to test key rollover. Here’s 6KRO. You’re limited to pressing 6 keys at once, excluding modifiers. NKRO mode seems to work. I seem to be able to press any amount of keys and they all register. Here’s a screencap I got in NKRO mode. It doesn’t show all keys pressed since I’m only human. Next up are the typing tests. I use this website. I do three runs and then take the average WPM and errors. So I averaged 101 WPM for the QuickFire TK with 4 errors; a significant improvement over the rubber dome Logitech G11, for which I averaged 88 WPM with 3 errors. 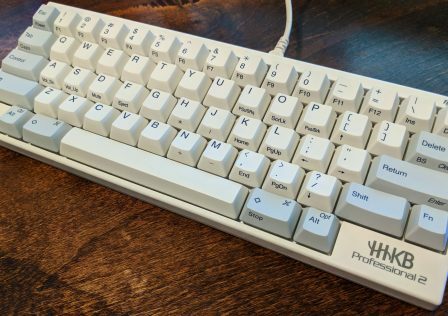 The QuickFire Pro with Cherry MX brown switches is in the lead at 103 WPM with 3 errors. It’s hardly a difference though, it fits well within my margin of error or maybe the barely-tactile feel of MX Browns helped a bit. I’ve used MX Red switches before, so this was mostly the same experience. It’s my preferred gaming switch; its lightweight and linear nature allows for faster double tapping and great responsiveness. Although the Cherry stabilizers make the bigger keys like spacebar, shift, and others feel different, it doesn’t really affect gaming even though they seem a tiny bit less responsive compared to Costar stabilizers. No matter the purpose, I recommend mechanical keyboards due to their superior feel/responsiveness and reliability, plus customization if you’re into that sort of thing. 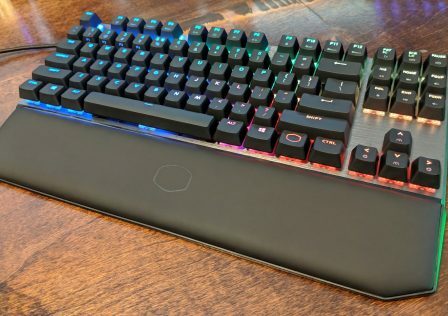 Although the QuickFire TK doesn’t quite match the quality of the QuickFire Rapid, it’s still a very good keyboard and certainly an innovative one. I want to see more 92-key boards, and more compact backlit boards. The functionality is fantastic, being capable of NKRO over USB and has all of the lovely features introduced by the QuickFire Rapid and Pro.